Chiseled Edge Countertops – CustomCreteWerks, Inc.
To use a chisel, one must have superior strength, sharp tools and the right material. Creating a masterpiece can take months or years. It took Michelangelo over two years to complete David. Unlike marble, wood and stone, you can achieve a chiseled edge with concrete cast in a mold that won’t add years to your home’s project. 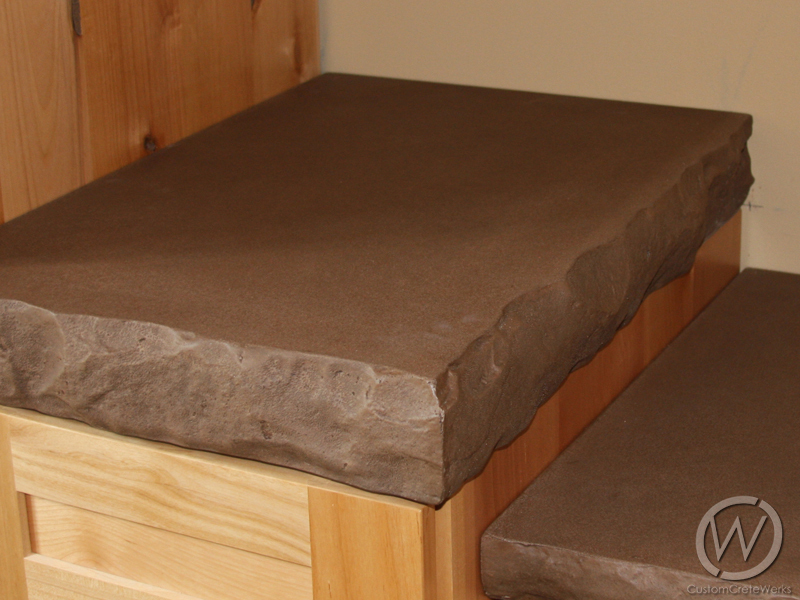 If you’re looking for a rustic, earthy or raw element to your concrete countertop, it is surprisingly easy to do. All of our designs are molded to fit your home’s style. The edge of the countertops is just one of many choices you can make including color, thickness and finish. Additionally, there is no transition seam from the surface to the edge, meaning it is one solid piece. The final product is sure to be an impressive addition to any space. The professionals at CustomCreteWerks are masters in helping you obtain the look you want without needing to chip away your time or design. One Response to "Chiseled Edge Countertops"
I am looking for 2 -28” vanity tops for a double bowl sink that has the rough edge. Where are you from?? Do you ship and the cost? ?